How familiar are you with Leiden University and its place in the Second World War? You may possibly think of heroes such as Cleveringa or other well-known names. Less well known are the unsung victims who disappeared almost without a trace from the University between 1940 and 1945. 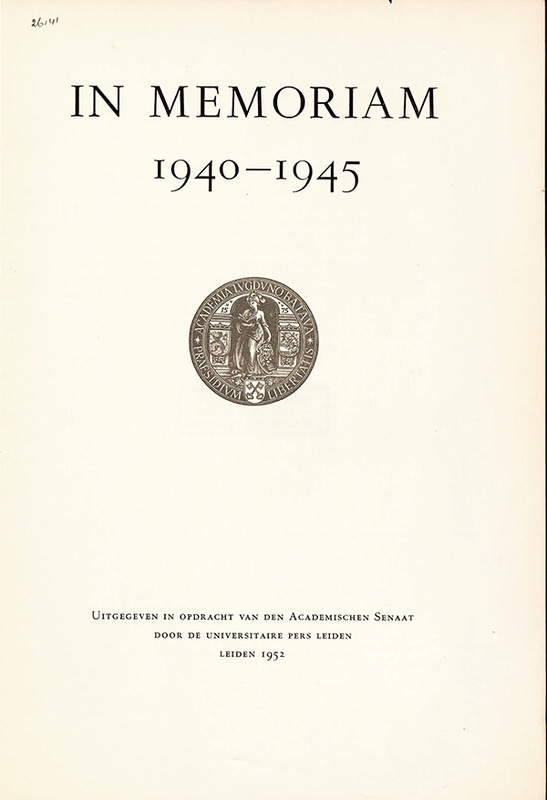 In 1952 In Memoriam 1940–1945 was published, containing a list of all the Leiden students and alumni who did not survive the war. A digital version of this work has now been made available by the Leiden University Libraries as part of an effort to save their names from oblivion. This book was digitised at the request of students from the working group Cultural Memory: Shoah in Monuments, Arts, Film and Literature, which is part of the Department of Netherlands Language and Culture. This series of lectures devotes attention to the culture of remembrance of the Second World War, also within the context of Leiden University. An important element in the present-day culture of remembrance at Leiden is the annual Cleveringa Lecture, named after the Leiden professor Rudolph Pabus Cleveringa (1894–1980), who in November 1940 held a public lecture to denounce the dismissal of a Jewish fellow professor. Nevertheless, the emphasis on freedom and resistance blurs the view of those who were simply unable to offer resistance. The students of the working group feel strongly about giving a place to all the victims of the War – most of whom were Jews – in the collective memory of the university. In Memoriam 1940–1945 gives the names of all 663 victims according to the year of their matriculation at Leiden. The digitisation of this written monument is yet another step towards a more complete memory of the War. Post by "Cultural Memory: Shoah in Monuments, Arts, Film and Literature", a working group of students which is part of the Department of Netherlands Language and Culture.